Our beneficiaries really need as much help as we can give them. The costs involved with the work they all do are astronomical, and they are extremely grateful for every cent. However, we also like to give something back to those that support us, and thanks to artist Moragh Dann, aka ‘Mogs’, we have a great lucky draw prize to offer you. All donors will stand a chance to win this amazing one of a kind rhino artwork. The piece measures 80cm wide by 60cm high. Every R50 donated will get you a ticket into the lucky draw to win this awesome piece of art. 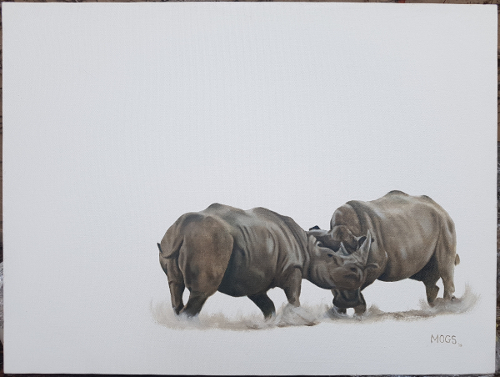 If you would like to make a donation to our fundraising efforts (and stand a chance to win this beautiful piece of rhino artwork), please select your donation option below. All transactions are securely handled by our online payments provider, Payfast. If you are donating from outside of South Africa, you can donate via PayPal. All funds donated will be split equally between our beneficiaries, the Kariega Foundation, OSCAP, Saving The Survivors and the Chipembere Rhino Foundation. 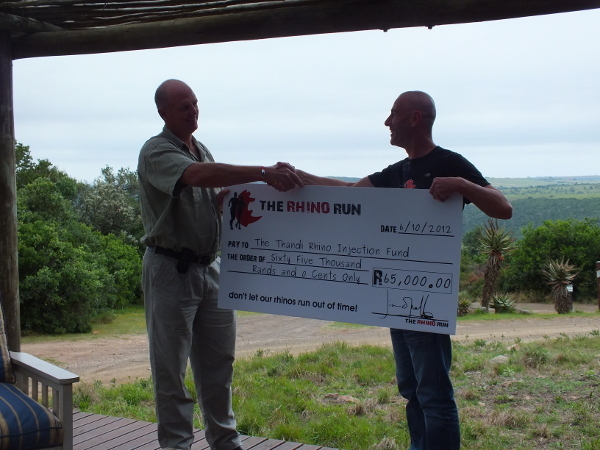 To date, with all of your support over the last 5 years, we have managed to raise R705,000.00 through this event. As it grows beyond South Africa’s borders, we hope that we’ll be able to increase that number significantly. Thank you to each and every single one of you for your support. Together we CAN make a DIFFERENCE! Lets turn this into a global trail running event and shake the world to let them know that we will not let our rhinos run out of time!